« And on this farm he had a goat. 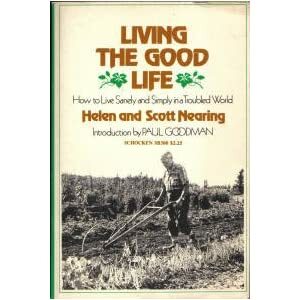 Helen and Scott Nearing’s “Living the Good Life: How to Live Sanely and Simply in a Troubled Word”, inspired me to change my life. Fleeing a Depression-ridden New York City in 1932, the intellectual Nearings created the ultimate DIY project in rural Vermont; they created a small maple sugar business on their hand-built homestead, grew their own food using mindful farming techniques, and promoted peace in their community and all over the world with their books and public speaking engagements. They inspired thousands in a back-to-the-land movement that began in the 60s and has resurged today with the small organic farms that are popping up seemingly everywhere, including our backyard micro-farm at Animal Place. The book that inspired me to take up veganic farming and live more simply. Scott was labeled a radical not only for his activism for peace, but for his outspoken opposition to the child labor that was rampant in his time. In the spirit of my hero, a fellow vegetarian, I propose something equally incredulous in our time: let’s put an end to the rampant slavery of animals, who, like children, cannot defend themselves from whatever cruelty we impose. But I’m already vegan. What about the farmers? Are they doing their best? Eat local. Eat vegetables. From popular books like the Omnivore’s Dilemma, and blockbusters like Food, Inc., consumers know what they are supposed to do, though I think both of these resources underestimate what our “best” could be. If you haven’t gone vegan yet, there are plenty of educational materials to help you on your journey, and I hope that you begin today. Check out the totally accessible 30-day Vegan Challenge from Oakland’s darling Colleen Patrick-Goudreau. Do your best…for you, for the planet, and for all beings on this planet. Even if you are already vegan, more than likely there are feathers, bones, blood and other animal atrocities in your kale, turnips and tomatoes. Whether you buy your organic produce from Whole Foods, the local co-op or farmer’s markets, there are dead animals in the compost, fertilizer and potting mixes used to grow those seemingly kind foods. Attending a soil class at a local, organic supply store – the popular Peaceful Valley Garden Supply, to name names – the educator told our group of young organic farmers that bat guano was not sustainable and no good farmer should ever use it. In the next breath, she turned our attention to the store catalog for her all-time favorite fertilizer: fish emulsion. In her opinion, it’s sustainable to use (and make a profit from) the byproducts of the diabolical fishing industry, even if it ravages our oceans in the process. This is how the next generation of farmers that will grow your fruits and vegetables are being educated. In simple terms, three of the most important nutrients that plants need to grow are nitrogen, phosphorus and potassium, or N-P-K. While most organic farmers feed their soils with animal products, there are kinder, more sustainable products and methods that provide these ingredients which do not enslave animals or destroy aquatic life. The North American Vegetarian Society’s article about plant-based agriculture gives a great introductory to veganic farming. For the nitty gritty details, I’ve just started reading Iain Tollhurst’s Growing Green about stock-free farming in the UK using green manures and crop rotation. Our mission at the Animal Place micro-farm is to create a successful and sustainable farm using only plant-based inputs. This will serve as a model for other farmers, most importantly our neighbors who are using and promoting the use of animal products. But I’m not a farmer. What more can I do? Ask the growers at your farmer’s market to offer stock-free products. You may have to educate them about what this means to you and our planet. Tell the hobby gardeners in your social circle to use plant-based amendments and techniques; Google “veganic farming”. Help us establish our veganic farm at Animal Place through volunteering or donation. Or, though few in number, support a veganic farm near you.